Historical Sketch of SNBC compiled by Rev. Frank Hughes, Jr.
"Atoms from Amos". Rev. Frank Hughes, Jr.
From the Kitchen of Mrs. Frank Hughes, Sr.
What is the Southern Baptist Convention? Baptist Church History: Understanding "The Baptist Faith and Message"
How do we hear from God? The "Alpha Course" embraces a doctrine that is characterized by speaking in tongues, prophecy, healing, and baptism in the Spirit: all Charismatic hallmarks. The course features a "Holy Spirit Weekend" where the Charismatic elements of the course are taught. The section of the course known as "Ministry Time, is associated with the false teaching of John Wimber, a Charismatic who has led many astray, both inside and outside of the church. He is a devotee of "Signs and Wonders" of Manifestation of the Holy Spirit, Healing the Sick, and Casting out Demons. Wimber and his followers have a mechanistic approach to the Holy Spirit, that is, if certain procedures are followed, then God is expected to operate as if He is some intangible force at the beck and call, (like some kind of "cosmic bellhop") of believers. Lyrics of songs and choruses and their mantra-style, along with group conformity, combine to create and precipitate alleged ecstatic and esoteric manifestations; which of course, are false, and go against the teaching of the Bible. "Alpha" undermines the basic tenets of Scripture, opting for the "Feel good" factor, that is part of the general cultural drift of the post-modern society, where practically any form of morality is acceptable. Hence, "Alpha" has little emphasis on sin, guilt, and basic Bible beliefs. THE "NEW AGE" OF "ALPHA"
Is the popular Alpha Course leading people astray? Many people have been greatly impressed by the Alpha course. Designed to be an introduction to the Christian faith through talks, video presentations, small-group discussions and a special weekend-away, lots of churches are now employing it as part of their outreach. In the eyes of many it has been a run-away-success and its fame has spread far beyond the UK, and Holy Trinity Brompton, the London church where it originated. It is no exaggeration to say it has spread right across the world and is now finding friends in several continents. It has been adapted so as to be accessible to young people and has also proved versatile enough to be used in prisons, schools and places of work. Churches in inner cities and rural areas have found it sufficiently flexible for their needs. Future plans for expansion suggest that Alpha is very much here to stay. What is more, many people claim to have been helped through going on the Alpha course and believe it has ought them an understanding of God and how to respond to Him. Testimonies and accounts of wonderful things that have happened to individuals abound; In the light of all this, surely there cannot be anything wrong with it? With so many in today’s society gripped by materialism and atheism, can Alpha be anything other than a good thing? As young people become hopelessly enmeshed in a godless culture, should we not applaud the efforts of Alpha and help make it a success? We wished that the answers to these questions could be an emphatic Yes. But closer examination of Alpha prevents such a clean bill of health being given to it. Why this concern? There are six vital reasons we would like to bring to your attention. 1. The God of Alpha is not the God of the Bible. Now of course much more could be said. But you will have to search hard and long in Alpha to find a God that resembles the One just described. Nothing about Him as Creator, nothing about Him as a great King. He is assumed rather than described. The Bible tells us “It is a fearful thing to fall into the hands of the living God” (Hebrews 10:31). But we would not be any wiser of this from going on the Alpha Course. It simply fails to tell us anything we need to know about God. 2. The plight of man in Alpha is not as serious as in the Bible. Man’s state until he is reconciled to God is not a happy one. Psalm 7:11 tells us God is a just judge, And – “God is angry with the wicked every day”. The gospel of John makes this abundantly plain: He who believes in the Son has everlasting life; and he who does not believe the Son shall not see life, but the wrath of God abides on him. (John 3:36) Man without God is subject to the wrath of God. We are not slightly displeasing to Him. It is not that we have occasional faults and foibles that surface. It is what we are by nature. The apostle Paul explains that we are “by nature children of wrath” (Ephesians 2:3). This is very strong language and leaves us in no doubt. We have offended against God and broken His holy law. We are sinners in His sight and deserve condemnation. It is as straightforward as that. By contrast, Alpha does not use strong terms and leaves us rather unclear about where we stand. As one follows its argument, sin is more to be seen in the way we have messed up our lives (Gumbel 1994: 44,47). It is an inward-looking description of man’s state that majors on his feelings of fearfulness (Gumbel 1994:22). It is a picture of man predominated by his feelings of sadness and unhappiness (Gumbel 1994:12-22). sup1/sup. Now of course these things are all true. This is what life is like for sinners. It is a miserable life for them. Yet this is to major on the consequences of sin rather than sin itself. These are the miseries that follow inevitably because we are sinners. The problem, however, is more serious than simply sin’s consequences. Alpha fails to tell us that ultimately we have offended God and courted His displeasure. We have sinned against God and are justly under His judgement. We are people “…having no hope and without God in the world” (Ephesians 2:12). For all the gravity of sin, Alpha never allows us to feel too bad about ourselves. It never permits us to see ourselves in God’s sight. That is a big omission. 3. The Jesus Christ of Alpha is not the Jesus Christ of the Bible. This may surprise us. Alpha appears to have quite a lot to say about the Lord Jesus. It tells us what He did, what He said, the claims He made about Himself and establishes beyond doubt that the resurrection actually took place. But despite having part of the course entitled ‘Why did Jesus die?’, it is unable in the final analysis to answer this question. This is a core issue. Christ died because God’s holy justice required it. Our lives were forfeit. We had sinned and were helpless. Christ had to die in the place of sinners who truly deserved to bear the penalty for their sin. Christ’s death propitiated or appeased the wrath of God (Romans 3:25,1 John 2:2). Alpha has not described God to us and therefore has no meaningful place for God’s wrath. Christ’s death ends up having to satisfy some abstract principle of justice that has somehow become detached from God Himself. Alpha’s own illustrations and attempts to explain get us no closer to the heart of the matter (Gumbel 1994:19-20;47-48). Christ’s death upon the cross becomes an act of love but without any real connection with the reality of judgement and God’s wrath. All we are left with is the impression that Christ has sacrificed Himself to rescue us from the consequences of sin because that was required by some impersonal and rather arbitrary justice system. It is all rather mysterious. This is not the Christ of Scripture. 4. The love of God in Alpha is not the love of the God of the Bible. The Bible is clear that ‘God is love’ (1 John 4:8). Alpha tells us this too. There is a difference, however. In Alpha God is love and little else. There is not much else that He can be as the course has missed all the aspects of His great character that refer to His holiness and glory. We are left with love. Why did the Lord come? To save sinners. What moved God to do this? His love. This is what makes His love so special and wonderful. It is that such a holy and glorious God should save sinners. This is clear from Romans 5:8 as well, But God demonstrates his own love towards us, in that while we were still sinners, Christ died for us. God’s love is evident in that He acted to save sinners. Here we see the glory of Christ’s love. But without the context of God’s holiness and absolute perfection, the meaning of that love is lost to us. Instead God merely becomes an emotional being of unconditional love divorced from any true understanding of His true nature and being. Alpha’s God will give us an emotional high and make us feel special. The God of the Bible will give us eternal life. There is a big difference between the two. 5. The Holy Spirit of Alpha is not the Holy Spirit of the Bible. There is more space in Alpha devoted to the Holy Spirit than to the Lord Jesus. This is surprising given what Scripture says about the Holy Spirit (John 16:13-14). Why does Alpha do this? It is because Alpha’s ‘Holy Spirit’ is the agent for giving to people an ‘experience’ that is going to make God real to them. The main focus for this is the ‘Holy Spirit Weekend-Away’. People doing Alpha are told to expect all manner of things might happen to them. We are told, Sometimes, when people are filled, they shake like a leaf in the wind. Others find themselves breathing deeply as if almost physically breathing in the Spirit. (Gumbel 1994:136). It is not restricted to this, however. This is all very interesting but it has nothing to do with the Holy Spirit as known through the pages of Scripture. Nowhere are any phenomena such as these attributed to the work of the Holy Spirit. Alpha’s ‘Spirit’ appears to work in ways that lie outside the confines of Scripture. Whoever it is that people are ‘introduced’ to at the Alpha Weekend, it is not the Holy Spirit. But whoever the mysterious guest is, he is equally at home among the ecstatic gatherings of New Age enthusiasts and non-Christian religions alike. 6. Conversions in Alpha are not like conversions in the Bible. On the Day of Pentecost, Peter’s hearers were ‘…cut to the heart…'(Acts 2:37). The Philippian jailer asked urgently ‘Sirs, what must I do to be saved?’ (Acts 16:30). They understood that they were sinners. They realised that they needed mercy. It was clear to them as it was to the believers in Thessalonica that the gospel was ‘…in truth, the word of God…’ (1 Thessalonians 2:13). Conversions in Alpha come differently from this. More often than not it is an emotional experience about the love of God but without any understanding of holiness or the need to be saved from our sins. There is no recognition of the need to repent and to turn to God as a matter of life and death. People feel forgiven but do not seem to have realised the depth of their sinfulness or repented of their sin. People feel cleansed without having consciously put their faith in Christ. Often this happens when people are in some ecstatic state. Alpha may regard this as conversion but it is not what we find in the Bible. For all its efforts, Alpha does not help us to know God. It does not describe the true and living God for us. It does not diagnose man’s condition accurately enough. It is unable to adequately account for Christ’s death and substitutes an unbiblical view of God’s love and God’s Holy Spirit in its place. To cap it all, the whole issue of conversion is grievously misunderstood. By sparing us the ‘bad news’ about ourselves, it is unable to supply us with the ‘good news’. The needs of our souls for biblical and life-saving truth are far too precious and important to be ought down to this level. 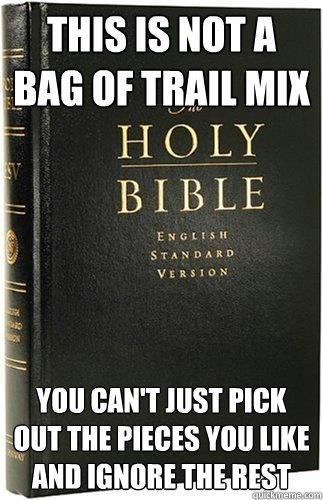 It needs the unvarnished truth of the Scriptures. We may merely succeed in adding people to our churches who have never been converted. That will be no help to them and no help to our churches either. To leave someone believing they are converted when they are not is an awful prospect. Yet that is what we are risking using defective tools such as Alpha, ‘having a form of godliness but denying its power’ (2 Timothy 3:5). We must do better. Failure is too high a price to pay. 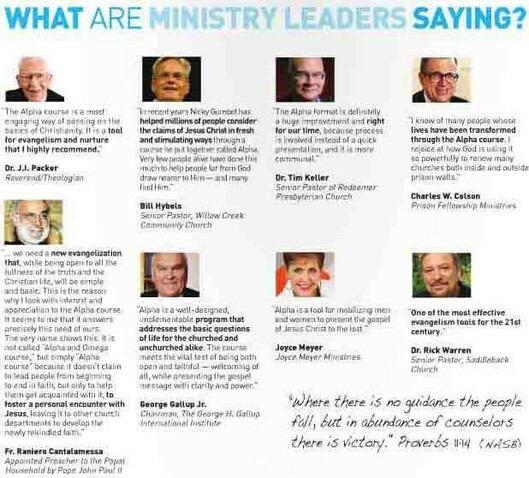 "ALPHA COURSE"......endorsed by "Seeker Sensitive" Rick Warren, Bill Hybels; and heretic Joyce Meyer.